These cups are handmade from stoneware clay for your retreats. Please call if you have any questions or need help with your order. Doug 210.494.8633 they take about 6 weeks to make so call early. We will put Acts and the year on the bottom. These prices are good for orders of 50 or more cups. 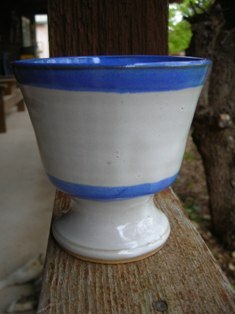 These cups, used in ACTS retreats, are approximately 3 1/2" tall and 3" wide.